The first newspaper in India, the Bengal Gazette started publishing from the city in 1780. Among Kolkata's widely circulated Bengali-language newspapers are Anandabazar Patrika, Bartaman, Sangbad Pratidin, Aajkaal, Dainik Statesman and Ganashakti. 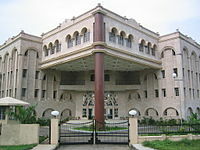 The Statesman and The Telegraph are two major English-language newspapers that are produced and published from Kolkata. Other popular English-language newspapers published and sold in Kolkata include The Times of India, Hindustan Times, The Hindu, The Indian Express, and the Asian Age. 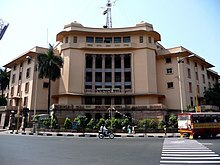 As the largest trading centre in East India, Kolkata has several high-circulation financial dailies, including The Economic Times, The Financial Express, Business Line, and Business Standard. Vernacular newspapers, such as those in the Hindi, Urdu, Gujarati, Odia, Punjabi, and Chinese languages, are read by minorities. 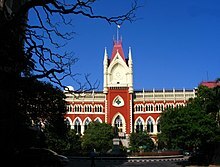 Major periodicals based in Kolkata include Desh, Sananda, Saptahik Bartaman, Unish-Kuri, Anandalok, and Anandamela. 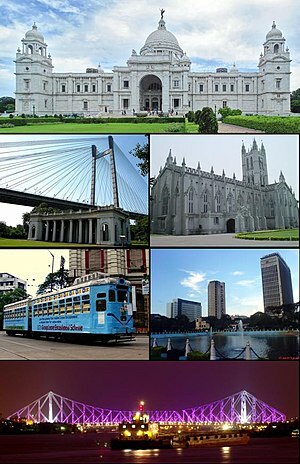 Historically, Kolkata has been the centre of the Bengali little magazine movement. ^ a b c d Chakravorty, Sanjoy (2000). "From colonial city to global city? 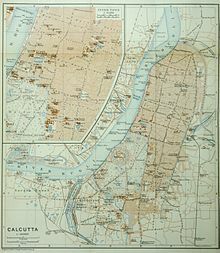 The far-from-complete spatial transformation of Calcutta". In Marcuse, Peter; Kempen, Ronald van. Globalizing cities: a new spatial order?. Oxford, UK: Blackwell Publishing. pp. 56–77. ISBN 978-0-631-21290-4. ^ Hardgrave, Robert L. Jr (1990). "A portrait of Black Town: Balthazard Solvyns in Calcutta, 1791–1804". In Pal, Pratapaditya. 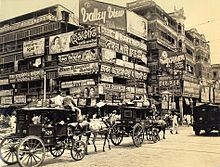 Changing visions, lasting images: Calcutta through 300 years. Bombay: Marg Publications. pp. 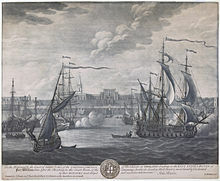 31–46. ISBN 978-81-85026-11-4. Archived from the original on 12 January 2012. ^ Chatterji, Joya (2007). The Spoils of Partition: Bengal and India, 1947–1967. Cambridge University Press. p. 9. ISBN 9781139468305. ^ Wright, Tom (11 November 2011). "Why Delhi? The Move From Calcutta". The Wall Street Journal. ^ Suhrawardy, H. S. (1987). "Direct action day". In Talukdar, M. H. R. Memoirs of Huseyn Shaheed Suhrawardy. 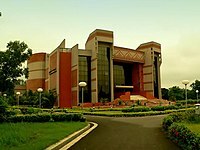 Dhaka, Bangladesh: The University Press. pp. 55–56. ISBN 978-984-05-1087-0. Archived from the original on 14 March 2006. ^ "Calcutta/Alipore Climate Normals 1971-1990". 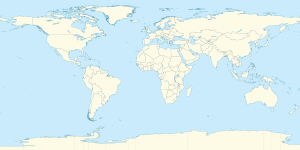 National Oceanic and Atmospheric Administration. Retrieved December 24, 2012. ^ "Ever recorded Maximum and minimum temperatures upto 2010" (PDF). India Meteorological Department. Retrieved May 16, 2014. ^ Ganguly, Deepankar (30 November 2006). "Hawkers stay as Rs. 265 crore talks". The Telegraph. 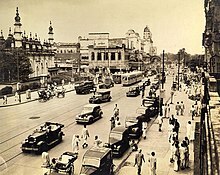 Kolkata. Retrieved 16 February 2008. ^ "End is nigh for Gandhis after India's marathon poll". The Times. 12 January 2014. Retrieved 12 May 2014. ^ M., Sonalee (16 March 2011). "Kolkata's retail story". The Daily Star. Dhaka, Bangladesh. Retrieved 11 December 2011. ^ "West Bengal industrial growth rate higher than national average". Economic Times. New Delhi. 1 December 2008. Retrieved 11 December 2011. ^ "AAI to modernise Chennai, Kolkata airports by fiscal end". Economic Times. New Delhi. Press Trust of India. 26 August 2011. Retrieved 7 December 2011. ^ a b c Bhattacharya, Malini (2005). "Culture". In Bagchi, Jasodhara. The changing status of women in West Bengal, 1970–2000: the challenge ahead. New Delhi: Sage Publications. ISBN 978-0-7619-3242-0. Archived from the original on 2 January 2016. Retrieved 10 February 2012. ^ Zarilli, Phillip; McConachie, Bruce; Williams, Gary Jay; Sorgenfrei, Carol Fisher (2010) . Williams, Gary Jay, ed. Theatre Histories: An Introduction. Abingdon, UK: Routledge. pp. 429–430. ISBN 978-0-415-46223-5. Archived from the original on 17 June 2013. Retrieved 9 March 2012. ^ de Graaf, G. J.; Latif, Abdul (April–June 2002). "Development of freshwater fish farming and poverty alleviation: a case study from Bangladesh" (PDF). Aquaculture Asia. 7 (2): 5–7. Archived (PDF) from the original on 18 March 2012. Retrieved 10 February 2012. ^ Bhowmik, Dulal (2012). "Durga Puja". In Islam, Sirajul; Jamal, Ahmed A. Banglapedia: National Encyclopedia of Bangladesh (Second ed.). 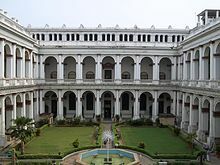 Asiatic Society of Bangladesh. Archived from the original on 5 October 2015. ^ Khosla, Varuni; Sharma, Ravi Teja (13 June 2014). "Forget cricket, football is catching fast in India". The Economic Times. Retrieved 20 September 2014. ^ "The automobile movement in India". The Horseless Age. 14 (9): 202. July–December 1904. Archived from the original on 2 January 2016. Retrieved 7 February 2012. ^ a b c d e f g h i Mazumdar, Jaideep (17 November 2013). "A tale of two cities: Will Kolkata learn from her sister?". Times of India. New Delhi. Retrieved 17 November 2013. ^ "Agreement on the establishment of Sister City Relations between Kolkata, Republic of India and Kunming, People's Republic of China". 23 Oct 2013. Retrieved 17 March 2018. ^ "Sister Cities". Official site of Odessa. Retrieved 17 March 2018.